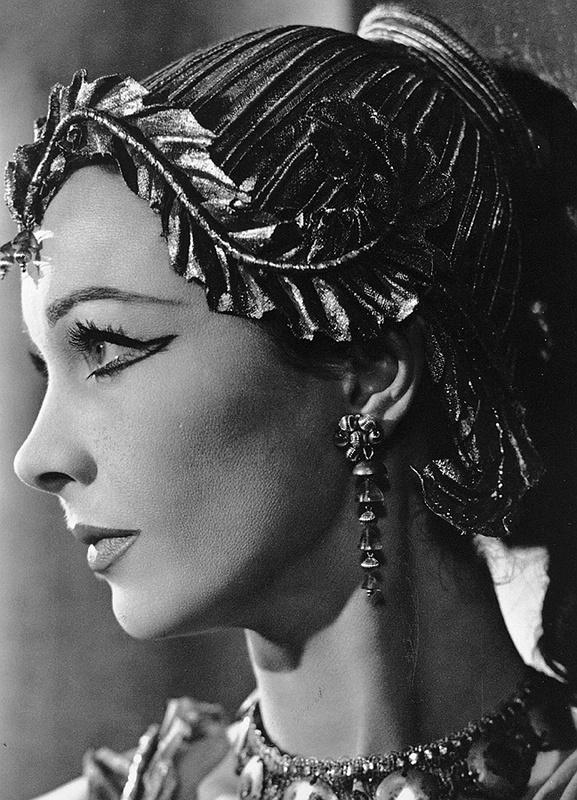 McBean’s favorite model—and muse—was Vivien Leigh (1913-1967), here photographed for a 1951 production of George Bernard Shaw’s Caesar and Cleopatra. 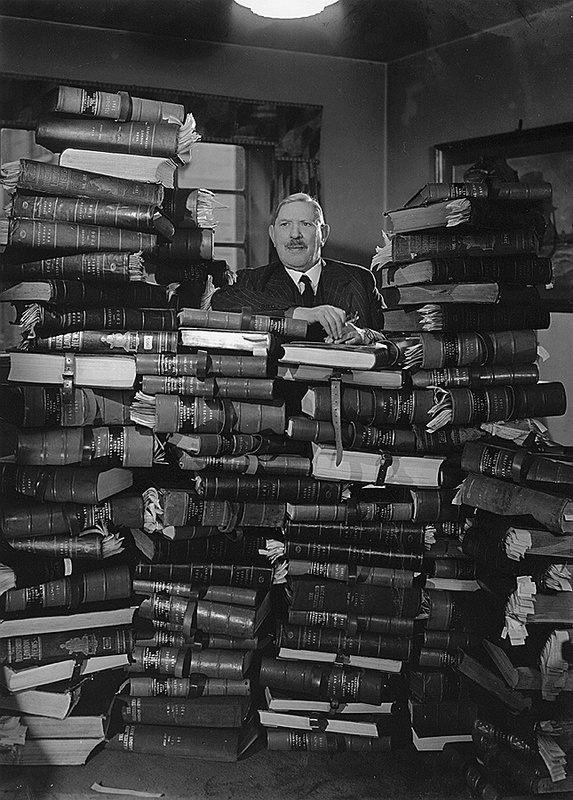 (At left) Bruce Ingram, publisher of the Illustrated London News, posed in 1950 with bound volumes of every edition of the paper since 1842. In 1970, the British theatrical photographer Angus McBean (1904-90) sold Harvard his oeuvre: a collection of 40,000 glass-plate negatives, weighing eight tons, that has become the most-requested archive of visual material in the Harvard Theatre Collection (part of Houghton Library). McBean (pronounced McBain) worked through the glory years of British theater from the 1930s to the 1960s; his career encompasses the early work of Laurence Olivier, Vivien Leigh, and Alec Guinness, as well as the next generation of stars, like Richard Burton, Audrey Hepburn, and Elizabeth Taylor. McBean shot Mae West and Noel Coward as well as West Side Story and the cover of the Beatles’ first album, Please Please Me (1963). The Theatrical World of Angus McBean: Photographs from the Harvard University Theatre Collection. (David R. Godine, 2009), by Fredric Woodbridge Wilson, curator of the Theatre Collection, is a handsome volume bringing together some of the photographer’s memorable images, all in black-and-white. (McBean, who was skillful at retouching his portraits, avoided color because it was far more difficult to alter.) He was “in nearly every sense a conservative,” Wilson writes in his introduction, noting that “in a photographic age that came to embrace the strobe light, the light meter, and the hand-held, small-format film camera, he employed cumbersome floodlights and a view camera that relied upon six-by-four inch glass plates [which Kodak stopped manufacturing during McBean’s lifetime]. He gauged his exposures by eye.” Yet those large glass plates could capture 30 times the detail of a 35-millimeter negative. As opera scholar Richard Traubner writes in an introductory essay, they recorded “the fabulously dark blacks, Velázquez-like in their density, and the dramatic chiaroscuro effects that were McBean’s hallmarks.” The result is a book bursting with visual drama.